A trio of aerospace companies have been selected to build two prototypes of a multi-role vertical-lift aircraft to replace thousands of the US Army’s helicopters. A joint project between Boeing and Sikorsky Aircraft along with Textron's Bell Helicopter will compete for the programme, which will ultimately replace up to 4,000 medium class UH-60 Black Hawk utility helicopters built by Sikorsky and Boeing's Apache attack helicopters after 2030. Sikorsky, a unit of United Technologies, and Boeing said in January they were teaming up to submit a joint proposal in response to an army technology demonstration project to attract design plans for the new aircraft. 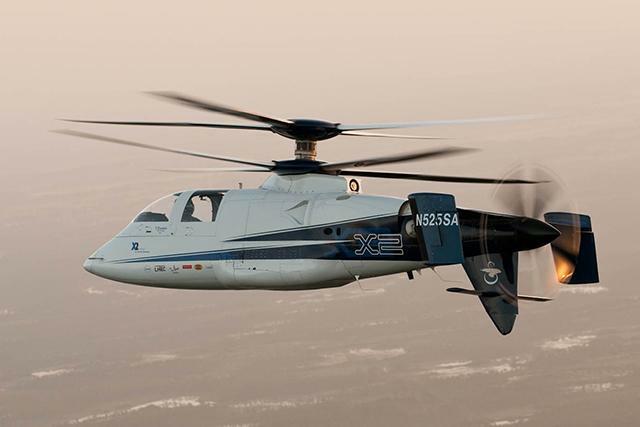 Their prototype helicopter SB>1 Defiant will build on the design of Sikorsky’s X2 concept helicopter and the first flight is expected in 2017, the companies said in a statement yesterday. The helicopter will feature a coaxial rotor design with counter-rotating rigid main rotor blades for vertical and forward flight. This will be augmented by a pusher propeller at the rear of the aircraft for high-speed acceleration and deceleration. Bell said yesterday it would develop a prototype for the programme based on its Bell V-280 Valor helicopters, which features a tilt-rotor design similar to that used in the V-22 Osprey helicopter it built with Boeing, with first flight also expected in in 2017. "The clean-sheet design of the Bell V-280 Valor creates the capability to fly twice the range at double the speed of any existing helicopter," said Bell's Keith Flail, director for the Valor program. Privately held Karem Aircraft and AVX Aircraft Co also bid for the programme, according to the US Army. The project, the precursor to the future vertical lift aircraft, could be worth upwards of $100bn (60bn), analysts said in February.